Find Dogs Clothes For Any Season! Dog clothes and accessories have risen in popularity, due in part to celebrities frequently seen with their well-dressed canine companions. If your pet is not part of the action, it's time to get caught up! Whether you are looking for small dog clothes or clothes for large dogs there are plenty of dog clothes to go around. We'll try to help you find the right sizes for every pet including the extra small miniature dog breeds. Besides the obvious fun reasons for dressing your small or big dog in stylish clothing, the practical reason is that very often some dogs actually need a coat or sweater to stay warm and protect their vital organs from the cold. In fact, the really tiny dogs - Chihuahua size - can benefit from wearing jackets and sweaters most of the time to keep from shivering. However, the level of protection they need to have from dogs clothes, does vary, mainly depending on the temperature inside or out. Luckily there are many choices to fit the climate, from lightweight clothes for pets to more protective weight. 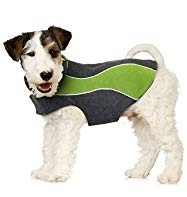 The main thing is that your spoiled dog will want to have a variety of smart dog clothes and accessories to be well-prepared no matter what the conditions or occasion. Even doggie booties are handy to have for extreme weather where pavements could be burning hot, or in winter, icy cold and salted to boot..excuse the pun. Although doggie boots would not be normal every day wear, experts say that in harsh conditions these provide good protection for your dog's paws. In case you are unaware of it, there are pet outfits to fit every occasion. Coats, sweaters, t-shirts, raincoats, harness coats, visors, hoodies - you name it. So why not start shopping for some designer dog clothes so that your dog, whatever size he happens to be, can show off his personality and be admired at every event. Here are some ideas to get you started. So What Dog Clothes And Accessories Are Basic Essentials? Cold weather...This is a given. Stepping outside for the daily walk on a snowy morning, you'll want to make sure that Fido is protected. Hey, you wouldn't go without your coat, would you? This is an easy way to make a fashion statement with a variety of small and large dog coats to suit the temperature. Rainy weather... No need for you and your dog to become couch potatoes on rainy days when there are so many cute dog raincoats to be had. Many dogs are mostly reluctant to face the rain, but you can easily coax them out with a a stylish raincoat to keep them dry. The same goes for chilly days of summer and spring. Even in the best of climates, the weather can turn stormy and cold. Don't miss a refreshing walk when you can just grab a dog coat or sweater and go. Dog clothes and accessories, at night... On night-time walks, keeping both you and your dog visible to other walkers, bicyclists, or approaching traffic is an important safety measure. Some of the dog accessories you can use for this purpose include: a reflective dog leash, reflective dog collar, or a reflective dog harness also referred to as a vest. Big dogs and small dogs alike need to be seen for their safety as well as others. We feature some of this items below. On the boat, be it a yacht or pontoon...Rover is not properly dressed until he has on a dog life jacket. They are readily available for small and large dogs and come in bright colors for good visibility. It's a really safe measure just in case your pet accidentally lands in the drink. Though dogs are good swimmers, they do not have the endurance to swim for very long. Life jackets are a must have. On hot days... a light cover up - perhaps a whimsical t-shirt would be just the right sun protection. Some dogs with thin skin or sparse coats, are very susceptible to sunburn, so it's a good idea to keep them covered. Sports Minded Pooch... A true sports fan will enjoy seeing their dog admired wearing a coat, sweater or tee that compliments their favorite sport. Or, if you are just taking your dog along to watch any sporting event at the local park, a colorful bandana might be just the right casual look for the occasion. Dog hats are also very popular for sporting events. Shopping days... If you like to take your small dog along on shopping trips, this is a perfect time to dress your pooch in a fashionable dog coat. And don't forget to wear something eyecatching yourself! Party days... No better time to put on the razzle-dazzle. Birthday parties for pets have become very popular and your is sure to get invited to some if he's a party animal But remember, there will be lots of competition for best-dressed pooch, so have a stunning outfit and a Rhinestone dog collar at the ready. Dog clothes for Traveling Hounds... your pooch will make a splash with an aviator, biker or bomber jacket if he's a jet setter pooch. For vacation trips on the road, keep him chic and comfortable in stylish boy dog clothes. When day is done... and after an evening stroll, small dog clothes turn toward jammies and bathrobes. Now's the time to get comfy on the couch and cuddle up with the master. The bathrobe will also come in handy on spa day! Don't forget while you are looking at dog clothes and accessories to also the take a look at dog necklaces and designer dog collars to complete the outfit. Be sure to measure your dog from the base of the head to the base of the tail by using a piece of string or yarn, then compare the result to a tape measure. Jot it down. Move on to the girth (that the chest at the widest part) in the same manner and jot it down. Lastly take a neck measurement. Now you'll have the information you need to order any garment from any manufacturer, because there will be variations between different products and vendors. If your dog is between sizes, choose the larger size. As you can see, there are many ideas for dressing up your pooch both fun and practical. Once you get started, no doubt you'll find many other creative ways to enjoy the world of dog clothes and accessories.